Acanthamoeba polyphaga Mimivirus, the first representative and prototype member of the Mimiviridae, is the latest addition to the menagerie of lesser-known big DNA viruses. Due to the size of its particle—a fiber-covered icosahedral protein capsid with a diameter of 0.7 μm—Mimivirus was initially mistaken for an intracellular parasitic bacteria. Its 1.2-Mb genome sequence was then found to encode more than 900 proteins, many of them associated with functions never before encountered in a virus, such as four aminoacyl-tRNA synthetases. The finding of Mimivirus-encoded central components of the protein translation apparatus thought to be the signature of cellular organisms revived the debate about the origin of DNA viruses and their possible role in the emergence of the eukaryotic cell. 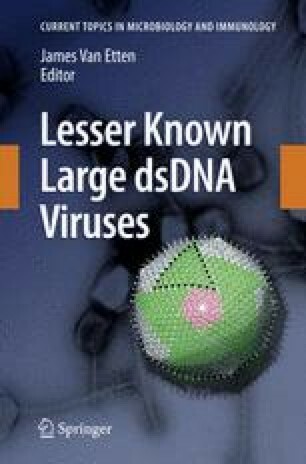 Despite the many features making it unique in the viral world, Mimivirus is nevertheless phylogenetically close to other large DNA viruses, such as phycodnaviruses and iridoviruses, and most likely share a common ancestry with all nucleocytoplasmic large DNA viruses. Postgenomic studies have now started in various laboratories, slowly shedding some light on the physiology of the largest and most complex virus isolated to date. This chapter summarizes our present knowledge on Mimivirus.